The Goshen Community Schools Foundation is offering Major Saver cards for sale. Elementary students will be selling the $15 cards featuring 20 buy-one-get-one-free offers until Monday, May 14th. 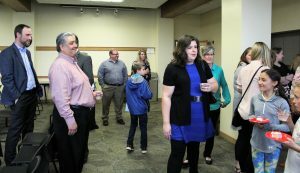 The 2018 participating restaurants/establishments include: Mega Blast Laser Tag, Mancino’s, Lux Café, Buffalo Wild Wings, Goshen Brewing Co., CiCi’s, Universal Tamal, Wendy’s, Trolley Café, McDonald’s, Goshen Family Restaurant, Papa John’s, Dutch Maid Bakery, The Electric Brew, DQ, Maple City Bowl, El Camino Real, Culver’s, Maple City Market, and Pride’s Express Carwash. Major Saver cards can be purchased via cash, check or online at www.majorsaver.com. You may also purchase a card from Mrs. Morrical in 1311. Thank you for your support! The unified track & field team will host the 2nd Annual Goshen Invitational this Friday night at 5:30 p.m. Come on out and cheer on the RedHawks at beautiful Foreman Field. Student Faculty Senate will have their last meeting of the school year this Thursday, May 3rd at 7:45 a.m. in the media center. All club sponsors are expected to attend and club members are encouraged to attend. IHSAA Student-Athlete Tip of the Week: This past weekend the NFL held their annual draft. Two of the first three picks were quarterbacks and over 200 college players were selected for the opportunity to play on Sundays. However, it was the quote from the 3rd player taken, by the New York Jets, that caught my attention. Sam Darnold, the quarterback out of the University of Southern California, had the classiest comment after his name was called. Upon leaving the stage after his selection, Darnold said, “Whatever the coaches want me to do, whether they want me to sit or want me to play, I want to star in my role.” In this day of self-promoting athletes, it’s great to see that this up and coming professional player has the proper outlook. High school student-athletes need more role models that they can look up to and emulate. Let’s hope more athletes at all levels share Darnold’s philosophy and star in their role! Congratulations to the GHS Wind Ensemble for qualifying for the ISSMA State Concert Band Finals this past Saturday! The band will play at 1:00 p.m. at Lawrence Central High School. We are proud to be among the finest concert bands in the state of Indiana! Congratulations to the Symphonic Orchestra for their Gold with Distinction at ISSMA State Qualifications this past weekend! They will be one of eight orchestras performing at the state finals this Saturday. 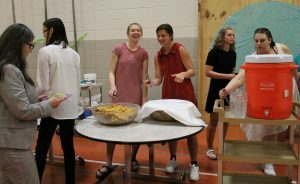 HELP WANTED: Sweet Corn Charlie Produce is looking for hardworking students with a good attitude for outdoor summer jobs. Apply by June 9th by e-mailing apply@sweetcorncharlie.com or leave a message for Tami on their application line at 574-304-7270. Any sophomores or juniors interested in attending the Stratford Trip next fall should check with their English teachers or swing by Mr. Caskey’s room in 3180 for more information. Come join us for a weekend filled with food, fun and outstanding theater! Stop in to support our GHS artists at the Spring Art Show that is taking place during First Friday’s in Goshen on Friday at the Goshen Youth Arts House at 324 S. 5th Street from 5:00-8:00 p.m. Awards will be presented at 6:00 p.m.
Lady RedHawk volleyball players (including incoming freshmen) our first open gym will be TODAY from 6-7:30 p.m. in Whiteman gym. We are hoping all girls interested in playing volleyball next fall can come to meet the new coach and staff. There will be an informational meeting for all volleyball players followed by open gym for any potential fall 2018 players. Spring sport athletes should plan to attend if all possible at any time between 6:00-7:30 p.m., but will not be allowed to participate in open gym until cleared by their coach. This is a great time to introduce yourself! We hope to see you all there Monday! Join us in Goshen on Saturday, June 9th for the Puerto Rico Rising 5k run/walk. Your run or brisk walk will take you along the Winona Interurban Trail, a paved surface that connects Bethany and Goshen College. The run will be followed with food, drinks, age group awards, CASH PRIZES and a raffle. A free t-shirt is included with registration. Please register at: https://runsignup.com/Race/IN/Goshen/RunforPuertoRico5k. If you have questions please email amberfalcon@mcc.org. Attention Seniors: Goshen College will be here on Wednesday in Guidance from 9:00 a.m.-12:00 p.m. This is the time for you to answers your questions regarding your enrollment process, scholarships or financial aid or any paperwork pending! Attention: It’s that time of year again to get your lunch accounts paid off. Starting on May 9th, you will NOT be able to purchase any a la carte items if you have a negative balance on your lunch account. Seniors: You need to get your negative lunch balances paid by the end of the school year! Prom tickets are now being sold for $45 each during lunches Tuesday-Friday through Friday, May 11th. Merit students may purchase tickets at Merit. Outside guest forms are available in the main office from Mrs. Wolfe. If you have questions please email Ms. Poling at bpoling@goshenschools.org. If you purchase your ticket by next Friday, May 4th, your name will be entered into a drawing. The winner will get a free ticket…..as in, you get your $45 refunded to you! Tickets will remain $45 through Wednesday, May 9th. On May 10th and May 11th the price will increase to $50 per ticket. It is that time of year again for the annual GHS Prom Dress Drive! The purpose of this drive is to provide free dresses for students who want to go to the prom but may be in financial need. We have several dresses in various styles and sizes to choose from. If you are in need of a prom dress or if you wish to donate a gently used dress, please contact Mrs. Hershberger or Mrs. Shakley. You may also ask your SRT teacher for more information. Key Club will have its last meeting of the year on Thursday during the 2nd session of SRT in the cafeteria. Student Athletic Council will meet on Thursday during the 2nd session of SRT. At this meeting, you can sign up to help with the Unified Track meet this Friday night, discuss and plan fan appreciation nights at spring events, discuss current events in GHS athletics, and complete a leadership activity. All current juniors and seniors who competed in sports this school year are eligible to attend. Any boy interested in playing football next fall should attend a call out meeting on Tuesday, May 8th in the Main Gym during the 2nd session of SRT. We’ll discuss the summer schedule, collect information, and talk about the future of our program. There will be a lot of information discussed. Please plan to attend! Boys varsity baseball defeated Wawasee 5-3 Friday night to improve to 5-1 in NLC play and 10-3 overall. Joey Peebles threw a complete game giving up no earned runs, striking out ten, and walking none. Reece Fisher and Austin Cain both had two hits apiece to lead the offense. Jocsan Sanchez led the offensive heavy game with seven RBI’s for boys JV baseball as they beat NLC foe Wawasee on Friday night by a score of 17-6. Four of those seven RBI’s were with one swing of the bat when Sanchez hit his first home run of the season with a grand slam. Skylar Reyes was the winning pitcher for Goshen. He allowed nine hits and six runs over five innings, striking out six. The RedHawks had 17 hits in the game. Jocsan Sanchez, Mason Schrock, Dominick Reyes, Colin Turner, and James Troyer each had multiple hits for the RedHawks. Girls tennis lost a nail biter to Westview as the ending came down to two 3-setters. Raina Shreiner Barger improved to 10-1 on the season and started things off with a win at 3 Singles. The 1 doubles pair of Kathryn Detwiler and Brooke Grewe stormed back from dropping the first set to win the next two in their most impressive performance of the season. Madison Rittenhouse won her 13th in a row, Katia Gutierrez prevailed at 2 Singles, and they swept doubles behind #1 pair Ally Olson and Sophia Kellenberg and #2 pair Maiah Huffman and Sydney Penner to help the JV improve to 6-1. Girls varsity softball stayed in it until the end but lost to Wawasee by a score of 4-3 in nine innings. Brynn Shoup-Hill had two hits, while AnaMaria Ramirez, Maddie Cross, Elkah DeVoe, and Klair Grose each added one hit. Grace Vance started the game in the circle pitching five scoreless innings while Brynn Shoup-Hill pitched the last four innings. The RedHawks are now 7-7 and 3-3 in the conference. Coach Kulp would like to thank all the fans for supporting the Strike Out Cancer Night! Girls JV softball beat Wawasee 13-9. Sophia Koshmider picked up the win with relief help from Ruth Whitehead. On offense Goshen was led by Ruth Whitehead with three hits and four RBI’s. Ally Lynn added a two run triple and Melissa Garcia had a hit with an RBI. Goshen improves to 7-4 overall and 5-0 in the NLC. Boys varsity baseball defeated a quality New Prairie team 4-3 in a non-conference match up on Saturday. Joseph Good got the win on the mound throwing six strong innings, allowing one earned run and not surrendering a walk. Philip Wertz pitched the 7th for the save. Offensively Wertz and Robbie Riegsecker both had two hits. The girls tennis team edged Bethany on Saturday by a score of 3-2. Madison Rittenhouse had a double bagel in in her varsity debut at 3 Singles to start things off for the RedHawks. She is now 15-0 this season. The 2 doubles team of Sage Christner and Sophia Kirkton scored the next point for the girls, overcoming a slow start to win in straight sets. The 1 doubles pair of Brooke Grewe and Kathryn Detwiler clinched the win in a 2nd-set tiebreaker. The short-handed JV squad came away with a 3-3 tie. Katia Gutierrez, Courtney Sloop, Sophia Kellenberger, Maiah Huffman, and Sydney Penner won their matches. 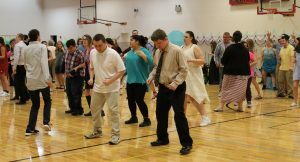 The Goshen Unified Track and Field team traveled to East Noble to face five opponents – Carroll, Central Noble, Dekalb, East Noble and Homestead. Several personal bests were set in a very competitive meet. In shotput, personal bests were set by Brock Collins, Laura Elliott, Allen Guthrie, Kateleen Marquez, Jesse Rhodes, and Meiling Yordy. In long jump, personal bests were set by Laura Elliott, Hayli Harley, Isaiah Jacobs, Noah Olmedo, Austin Peeler, Jurniee Peeler, Emma Simpson, and Lexi Tucker. In the 100m dash, personal bests were set by Brock Collins, Hayli Harley, Hope Peeler, Jurniee Peeler, Hazel Rhodes, Jesse Rhodes, and Emma Simpson. In the 400m dash, personal bests were set by Adrian Garrett, Hazel Rhodes, Laura Scott, and Zach Templeton. The 4x100m girls relay team of Lexi Brown, Laura Scott, Lexi Tucker, and Jazmin Vargas set their season best time of 1:34. Boys JV baseball dropped a non-conference game at New Prairie on Saturday morning by a score of 9-7. Goshen’s big inning was in the 5th when they were able to plate three runs. Jocsan Sanchez and Skylar Reyes each drove in runs for the RedHawks. Goshen drops to 6-4-1 on the season. Girls softball will host Northwood. JV plays at 5:00 p.m., followed by varsity at 6:45 p.m. Boys JV and varsity baseball will play at Northwood at 5:00 p.m.
Stop in to support our GHS artists at the Spring Art Show that is taking place during First Friday’s in Goshen on May 4th at the Goshen Youth Arts House at 324 S. 5th Street from 5:00-8:00 p.m. Awards will be presented at 6:00 p.m.
Lady RedHawk volleyball players (including incoming freshmen) our first open gym will be on Monday, April 30th from 6-7:30 p.m. in Whiteman gym. We are hoping all girls interested in playing volleyball next fall can come to meet the new coach and staff. There will be an informational meeting for all volleyball players followed by open gym for any potential fall 2018 players. Spring sport athletes should plan to attend if all possible at any time between 6:00-7:30 p.m., but will not be allowed to participate in open gym until cleared by their coach. This is a great time to introduce yourself! We hope to see you all there Monday! Attention German students: Sign up for the bowling party TODAY in room 1460! Are you interested in learning more about what GSA has to offer? Do you need something to do TONIGHT? Do you just really like hanging out with friends and playing games? Come join members of Goshen High School’s GSA at 7:00 p.m. TONIGHT here at GHS for food and games. We hope to see you there! Check out one of our posters for more details. Attention Seniors: Goshen College will be here on Wednesday, May 2nd in Guidance from 9:00 a.m.-12:00 p.m. This is the time for you to answers your questions regarding your enrollment process, scholarships or financial aid or any paperwork pending! IHSAA Student-Athlete Tip of the Week: Sometimes off-season workouts can become boring and monotonous. With summer approaching, have you given any thought as to how you will approach your training and conditioning while not being in school? Call it the buddy system if you wish, but working out with a teammate, brother or sister, or an up and coming underclassman, makes the time go faster and the hard work seem easier. So whether it’s heading to the gym for individual workouts, or out running for conditioning, or heading to the weight room for your weight training, try to find someone with similar goals to workout with you. By finding that right person, you can hold each other accountable and reach your full potential while still having fun and trying to make each other better! Key Club will have its last meeting of the year on Thursday, May 3rd during the 2nd session of SRT in the cafeteria. Girls varsity tennis lost to state-ranked Concord on Thursday. JV suffered their first loss of the season by a score of 3-5. Madison Rittenhouse won 6-0, 6-2 to extend her winning streak to 13. Katia Gutierrez and Joya Drenth also won their singles matches. Boys JV & varsity baseball will play at Wawasee at 5:00 p.m. Girls JV & varsity tennis will compete at Westview at 5:00 p.m. Girls softball will host Wawasee at Shanklin. JV plays at 5:00 p.m., followed by varsity at 6:45 p.m.
Unified track and field will compete at the East Noble Invitational at 6:00 p.m. Boys varsity golf will play in the Wawasee Invitational @ South Shore at 8:00 a.m. Boys & girls varsity track and field will compete in the John Reed Relays at East Noble at 9:00 a.m. Girls varsity tennis will play at Bethany at 10:00 a.m. Boys varsity baseball will host New Prairie at 11:00 a.m. on Phend Field. Boys JV baseball will play at New Prairie at 11:00 a.m.
Stop in to support our GHS artists at the Spring Art Show that is taking place during First Friday’s in Goshen on May 4th at the Goshen Youth Arts House at 324 S. 5th Street from 5:00-8:00 p.m. – awards are presented at 6:00 p.m.
Lady RedHawk volleyball players, including incoming freshmen, our first open gym will be this Monday, April 30th from 6-7:30 p.m. in Whiteman gym. We are hoping all girls interested in playing volleyball next fall can come to meet the new coach and staff. There will be an informational meeting for all volleyball players followed by open gym for any potential fall 2018 players. Spring sport athletes should plan to attend if all possible at any time between 6:00-7:30 p.m., but will not be allowed to participate in open gym until cleared by their coach. This is a great time to introduce yourself! We hope to see you all there Monday! 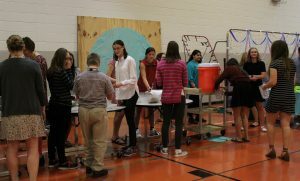 All seniors in fall and winter sports can stop by the ticket booth in the commons to see Mr. Kissinger for ice cream TODAY during lunch. This is a thank you from the Athletic Department for your commitment and hard work throughout your high school career at GHS. Wrestling Open Mats will be TODAY at 6:00 p.m. Attention German students: Sign up for the bowling party this Friday in room 1460! Are you interested in learning more about what GSA has to offer? Do you need something to do TOMORROW night? Do you just really like hanging out with friends and playing games? Come join members of Goshen High School’s GSA at 7:00 p.m. TOMORROW here at GHS for food and games. We hope to see you there! Check out one of our posters for more details. The girls track & field team lost its conference meet against Elkhart Memorial. They are now 6-3 overall and 2-3 in the conference. Girls varsity softball took a 1-0 lead in the 4th inning only to lose 7-1 against Concord. Ashton Darnell, AnaMaria Ramirez, Breanna Boocher and Elkah DeVoe all had one hit for the RedHawks. The RedHawks are now 7-6 overall and 3-2 in the NLC. The next contest is TOMORROW against Wawasee for the Strike Out Cancer Event. Come out and show your support! Girls JV softball defeated Concord 13-8. Ruth Whitehead added two hits, while Isabell DeGraff and Sophia Koshmider each had one hit. Jordan DeGraff also added a double for the night. Ruth Whitehead was the winning pitcher. The JV RedHawks are currently 6-4 overall and 4-0 in the NLC. Boys JV baseball jumped out to a first inning 10-0 lead on Wednesday afternoon and never turned back! Ezekial Moreno and Colin Turner led the RedHawk offense with four hits and three hits respectively as the RedHawks beat Concord by a score of 15-5. The offense combined for 14 hits. Jocsan Sanchez pitched five innings allowing only four hits and one earned run in a strong outing. He struck out four Minutemen and surrendered four walks. Boys varsity baseball won 13-3 in five innings vs. Concord. Austin Cain pitched a complete game shutout. Joey Peebles had two doubles and Will Koshmider was three for three. Boys JV and varsity golf will host Central Noble at 5:00 p.m. @ Maplecrest. Girls JV and varsity tennis will host Concord at 5:00 p.m. @ GMS. All seniors in fall and winter sports can stop by the ticket booth in the commons to see Mr. Kissinger for ice cream on Thursday, April 26th during lunch. This is a thank you from the Athletic Department for your commitment and hard work throughout your high school career at GHS. Wrestling Open Mats will be TOMORROW at 6:00 p.m.
Are you interested in learning more about what GSA has to offer? Do you need something to do this Friday night? Do you just really like hanging out with friends and playing games? Come join members of Goshen High School’s GSA Friday at 7:00 p.m. here at GHS for food and games. We hope to see you there! Check out one of our posters for more details. French Club: Chicago Trip permission slips are due TODAY! Please drop them off with M. Hobbs or Mlle Mack. Prom tickets are now being sold for $45 each during lunches Tuesday-Friday through Friday, May 11th. Merit students may purchase tickets at Merit. Outside guest forms are available in the main office from Mrs. Wolfe. If you have questions please email Ms. Poling at bpoling@goshenschools.org. The girls varsity tennis team lost a close match to Northwood by a score of 2-3 that included two 3-setters. Raina Shreiner Barger improved to 2-0 at 3 Singles varsity and the 2 doubles pair of Sophia Kirkton and Sage Christner won their second 3-setter in as many nights to improve to 3-0 in conference play. The JV won again to raise their record to 6-0 as Madison Rittenhouse stays unbeaten at 12-0 and the doubles pair of Sydney Penner and Maiah Huffman are now 10-1. Boys JV (GLL) and varsity (Phend Field) baseball will host Concord at 5:00 p.m. Boys varsity golf will compete at Triton at 5:00 p.m. @ Stonehenge. Boys JV and varsity track and field will compete against Concord and Warsaw at 5:00 p.m. @ Concord. Girls JV and varsity softball will play at Concord at 5:00 p.m. 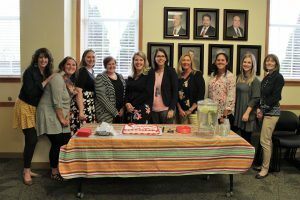 Prior to the board meeting, there was a reception for the West Goshen Elementary staff, in honor of their recent TAP Founder’s Award. 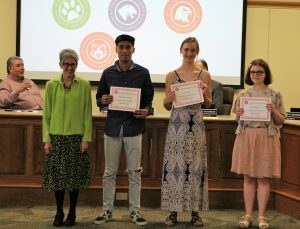 The board also recognized several GHS students who created new school logos to coordinate with the updated school corporation logo. 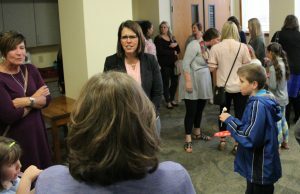 Those students were led by their teacher, Betsy Poling and corporation webmaster Megan Eichorn. 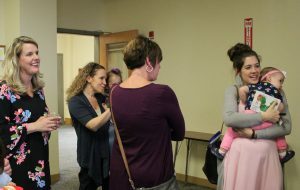 The students who worked on the logos were: Manny Castillo, Iyla Stoy, Ariel Thomas (pictured) and Alexis Ramos and Austin Bontrager (who were unable to attend). 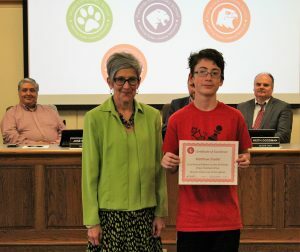 GMS student Matthew Snyder was also recognized following his win in a chess competition where he was outranked, but still managed to defeat his opponents in all four of his matches. 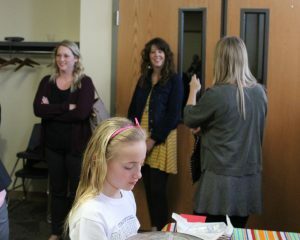 Prairie View teacher Kelsey Ambrosen and some of her P.V. 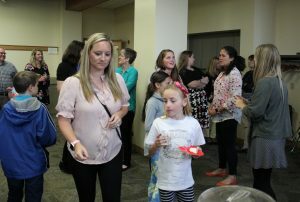 students were honored after she and one of her students received Little Big Ideas Grants worth $1,000. 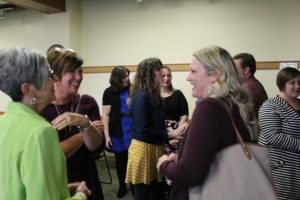 Kelsey’s grant was based on a book that encourages book scavenger hunts in your community, and Elisha Rauch’s grant was for the development of a sports podcast. 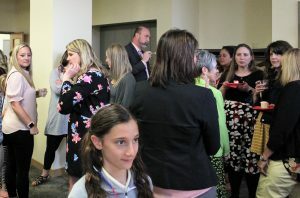 Congratulations to all who were honored and recognized at the board meeting! Thursday evening three of our GHS choirs participated in the ISSMA district contest. Each choir is scored by several adjudicators both in performance and in sight-reading. Crimson Choir received an overall silver award with a gold rating in sight-reading. Crimson Chorus and Advanced Crimson Chorale received overall gold ratings. These choirs are directed by Katie Miller O’Leary, Steve Snyder and Monica Stutzman. Congratulations to all who participated! Attention Seniors: Goshen College will be here TOMORROW in Guidance from 9:00 a.m.-12:00 p.m. This is the time for you to answers your questions regarding your enrollment process, scholarships or financial aid or any paperwork pending! French Club: Chicago Trip permission slips are due TOMORROW! Please drop them off with M. Hobbs or Mlle Mack. Prom tickets will go on sale TODAY and are $45 each. They will be sold Tuesday-Friday during lunches through Friday, May 11th. Merit students may purchase tickets at Merit. Outside guest forms are available in the main office from Mrs. Wolfe. If you have questions please email Ms. Poling at bpoling@goshenschools.org. Boys varsity baseball lost a heartbreaker to LaPorte by a score of 7-6 in eight innings after being a strike away from winning in the 7th. Will Koshmider had three hits for the RedHawks who got quality innings on the mound from Austin Cain, Koshmider, Philip Wertz and Eric Newell. The girls varsity tennis team pulled out a tight 3-2 win over Jimtown on a wet and windy Monday night. Raina Shreiner Barger prevailed in her varsity debut at 3 singles, and then the match came down to a 3rd set at both 2 Doubles and 2 Singles. Kathryn Detwiler was the first to come off the court victorious, winning by a narrow score of 6-4. Sophia Kirkton and Sage Christner were close behind with a 6-0 win to seal the team match. The JV improved to 5-0 this year, and Madi Rittenhouse won her 10th in a row. Boys JV baseball dropped their first NLC game by a score of 12-2 to Plymouth on Monday night. The Hawks fell behind 5-0 after the 2nd inning and were not able to make a comeback. Offensively, the RedHawks were held to one hit by freshman Ezekial Moreno. Tommy Cartagena and Joseph Good scored the two runs for the RedHawks. They drop to 4-3-1 on the season and 2-1-1 in the NLC. Klair Grose shined at the plate in the girls varsity softball victory over Plymouth by a score of 12-2. Klair went four for four with a double and two RBI’s. Brynn Shoup-Hill, Maddie Cross, Elkah DeVoe, Grace Vance and Makayla Snyder all had two hits for the night. Grace Vance earned the win in the pitching circle while Brynn Shoup-Hill got the save. Both pitchers had a combined one hitter for the game. The RedHawks are now 7-5 overall, and 3-1 in the NLC. Girls JV softball beat Plymouth 16-3. Ruth Whitehead picked up the win in the pitching circle while adding two hits and two RBI’S. Devin Shipley also added three hits, while Sophia Koshmider had two hits and three RBI’s. Melissa Garcia and Isabelle DeGraff both had two hits and two RBI’s. The JV team is now 5-4 overall and 3-0 in the NLC. Boys varsity baseball defeated Plymouth 9-3 on the road Monday night. The RedHawks led 3-0 going into the 6th. After Plymouth tied the game, Goshen broke out for six runs in the top of the 7th. Will Koshmider got the win in relief of Tyler Colpitts. Koshmider also homered and doubled with four RBI’s. Girls JV and varsity tennis will host Northwood at 4:30 p.m. Girls JV and varsity track and field will compete at Elkhart Memorial at 5:30 p.m.
Morgan and Electra are now eligible to participate in the Skills USA national competition which will be held in Louisville, Kentucky on June 25-29, 2018. 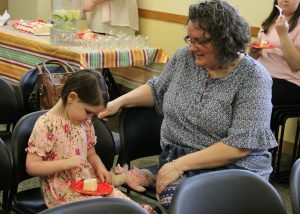 Congratulations, Morgan and Electra! Goshen High School and Goshen Community Schools are both extremely proud of your accomplishments! 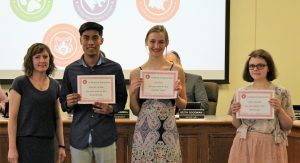 Congratulations to members of the Crimson Orchestra and Philharmonic Orchestra for earning a Gold rating this past weekend at the annual ISSMA Organizational Orchestra and Band Festival held at Northridge High School! Prom tickets will go on sale TOMORROW and are $45 each. They will be sold Tuesday-Friday during lunches through Friday, May 11th. Merit students may purchase tickets at Merit. Outside guest forms are available in the main office from Mrs. Wolfe. If you have questions please email Ms. Poling at bpoling@goshenschools.org. The girls varsity tennis team got their first win of the season over West Noble Friday night. Lucy Kramer at 3 Singles and the 2 Doubles pair of Katia Gutierrez and Sophia Kirkton were the first 2 courts off, losing one game out of their four combined sets. It all came down to Sage Christner at 2 Singles and the last match on the court, who clinched the win for the RedHawks. The JV improved to 4-0 behind singles wins from Raina Shreiner Barger, Madi Rittenhouse, Ally Olson and Joya Drenth, and doubles wins from Sophia Kellenberger, Courtney Sloop, Sydney Penner and Maiah Huffman. The boys JV baseball team defeated Elkhart Memorial on Friday night by a score of 8-6. That improves the GHS JV record to 4-1-1 and 2-0-1 in the NLC. Jocsan Sanchez pitched six innings for the RedHawks giving up only four runs and struck out six. Sanchez also contributed with his bat. He had two hits. Ezekiel Moreno also contributed with two hits in the offensive game. Kaleb Nine pitched the 7th inning recording his first save of the year. Boys varsity baseball defeated Elkhart Memorial 6-2. Joey Peebles also had two doubles at the plate. Austin Bontrager contributed two hits including a double. Girls varsity softball beat Elkhart Memorial 7-3. Maddie Cross, AnaMaria Ramirez and Brynn Shoup-Hill each had two hits for the night. Makayla Snyder added a triple while Maddie Cross, Elkah DeVoe and Alexis Navarro all added a double each. Grace Vance got the win in the circle. Girls JV softball defeated Elkhart Memorial 10-6. Isabell DeGraff picked up the win. Devin Shipley had three hits and two RBI’s. Ally Lynn added two hits with three RBI’s. Ruth Whitehead had two hits including an in the park home run. Goshen improved to 3-3 overall and 2-0 in the conference. Girls varsity softball lost the lead late in the 6th inning to Mishawaka ending with a final score of 8-5. AnaMaria Ramirez, Ashton Darnell and Brynn Shoup-Hill each had two hits for the day. Ashton Darnell also added a double and one RBI. Brynn Shoup-Hill pitched a great game keeping the Mishawaka hitters off balance, but unfortunately got the loss. Girls tennis lost to Fremont Saturday by a score of 2-3. Kathryn Detwiler won in straight sets in her singles debut, while the pair of Sophia Kirkton and Sage Christner won easily in their first match together in doubles. Girls JV softball lost game one by a score of 14-7 to Prairie Heights. Ally Lynn had two hits, two doubles and two RBI’s. Heather Geortzen also added two hits with an RBI. In game two, they defeated Prairie Heights 7-6 in a thrilling come from behind win. Down two runs with two outs in the bottom of the 7th, Ally Lynn hit a bases loaded single to drive in two runs for the win. Sophia Koshmider picked up her first pitching win in the circle. Ally Lynn had five hits with three RBI’s for the game. Jordan DeGraff and Cat Hoover each added three hits apiece. Don Perry led boys JV golf with a 99 at Pretty Lake Country Club in the Plymouth Invitational. Ben Schneider shot 104, Joseph Narayan 107, Derek Stotts 119 and Kaden Sheets 126. Goshen shot 429 to finish 11th out of 16 teams. The boys varsity golf team competed at the Lakeland Invitational. The RedHawks finished 4th in the 13 team field led by senior Peyton Cripe who fired an 81 and was 9th low medalist in the tournament. Junior Allan Garratt also played well shooting an 89. Cameron Schneider shot a 93, Ethan Vallejo 95 and Jake Jennette 100. The boys JV baseball team dropped a heartbreaker to LaPorte on Saturday. This dropped their season record to 4-2-1. Skylar Reyes pitched six innings while only surrendering two runs (one earned) on seven hits. They were down 1-0 going into the 5th inning and tied it up when Tommy Cartagena stole 2nd base and was able to score on an errand throw by LaPorte. They took a 2-1 lead when Kaleb Nine scored Moises Gutierrez on a suicide squeeze. The RedHawks offense was led by Jocsan Sanchez and Ezekial Moreno. Both players had two hits for the RedHawks. 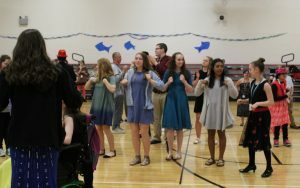 The Goshen Unified Track and Field team traveled to Wawasee on Friday to face five opponents (Warsaw, East Noble, Wawasee, Tippecanoe Valley and Elkhart Memorial). Several personal bests were set in a very competitive meet. In shotput, many 1st, 2nd and 3rd place finishes were accomplished in various flights. Taking part in the event were: Brock Collins, Laura Elliott, Allen Guthrie, Kateleen Marquez, Austin Peeler, Jesse Rhodes, Spencer Witmer and Meiling Yordy. In long jump leading the team were Isaiah Jacobs with a jump of 14’1’’, Allen Guthrie with a jump of 10’7’’ and Austin Peeler with a 10’ jump. Lexi Brown, Jeremiah Close, Nate Elliott, Allen Guthrie, Hayli Harley, Isaiah Jacobs, Austin Peeler and Jurniee Peeler all set their personal bests in the event. In the 100m dash, many 1st,2nd and 3rd place finishes in various heats. 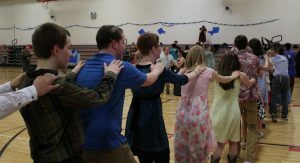 Taking part in the event were: Lexi Brown, Brock Collins, Nate Elliott, Emily Hall, Hayli Harley, Breighton Heaberlin, Kateleen Marquez, Hope Peeler, Jurniee Peeler, Lexi Tucker, Spencer Witmer and Meiling Yordy. In the 400m dash, Zach Templeton took 5th in his heat with a personal best time of 1:11, Adrian Garrett took 1st in his heat with a personal best time of 1:14, and Noah Olmedo took first in his heat with a personal best time of 1:16. In the 4x100m relay, the team of Jeremiah Close, Adrian Garrett, Isaiah Jacobs and Zach Templeton had a team best time of 59seconds (a school record). The JV girls tennis team finished two points and one match short of winning the 8-team Plymouth Invitational on Saturday, winding up in 2nd place. Raina Shreiner Barger lost only five games while winning 24 in three matches on her way to being crowned champion at 1 Singles. Madi Rittenhouse was also champion at 2 Singles. Both girls remain undefeated this season. Courtney Sloop finished 2nd at 3 Singles. Ally Olson and Sophia Kellenberger at 1 Doubles and Maiah Huffman and Sydney Penner at 2 Doubles all finished 3rd. Girls JV and varsity tennis will host Jimtown at 4:30 p.m. Boys JV and varsity baseball will play at Plymouth at 5:30 p.m. Girls JV and varsity softball will host Plymouth. JV plays at 5:30 p.m., followed by varsity at 7:00 p.m.
Mrs. Bruder’s 5th period German 1 class will be taking A lunch TODAY. French Club: Permission slips for the Chicago trip are ready for pickup! See M. Hobbs or Mlle Mack to get one and/or if you have any questions. The trip is scheduled for Thursday, May 31st from 4:30 a.m.-5:15 p.m.! Are you 16 years of age or older and looking for summer employment? Do you want to learn business and life skills while making incredible friendships and memories that last? Do you want more information? Please check out campmillhouse.org for more information or call (574) 233-2202. There is more information from Mrs. Stealy in the main office as well. Prom tickets will go on sale Tuesday, April 24th and are $45 each. They will be sold Tuesday-Friday during lunches through Friday, May 11th. Merit students may purchase tickets at Merit. Outside guest forms are available in the main office from Mrs. Wolfe. If you have questions please email Ms. Poling at bpoling@goshenschools.org. IHSAA Student-Athlete Tip of the Week: With the end of the school year only five or six weeks away, all student-athletes should be thinking about finishing strong in the classroom. This time of year it is so easy to look ahead to summer. However, don’t forget about the importance of your grades. The last weeks of school are just as important as the first few, so don’t let your grade point average slip. Think of the end of the school year like it’s the end of a ballgame. Don’t let all the hard work disappear in a one or two week period. Whether you play a spring sport or not, the next few weeks could determine a college choice down the road. Don’t look back next year (whether you are a senior or underclass man) and say if my grades were better last year I could be attending the college of my choice! Any girl interested in playing soccer this fall that did not make it to the meeting on Tuesday, please see Coach Wildman for spring and summer workout schedules. Our boys’ soccer program is hosting a pork, rice and bean fundraiser dinner TONIGHT. It will take place here in the high school cafeteria from 5:00-8:00 p.m. The cost is $8 for a pre-sale ticket and $10 at the door. You can dine in the cafeteria, but carry-out is available as well. Please see one of our soccer players for a ticket or contact Myron Bontreger, Matt Bjorkland, Rusty Maust Emery or Lucas Kauffman. Thank you in advance for your support! A LIFEGUARDING class will be offered at the Aquatic Center. It will meet the 2nd full week of June (June 11th-14th), and will meet Monday-Thursday during the day. To register for the classes, go to the Aquatic Center website at Aquatics.goshenschools.org and click on LifeGuard Registration. REMINDER: The recycling bins (the ones with black lids with small holes) around the school are to be used for recycling only. These are NOT regular trash cans. Thank you in advance for placing things where they are supposed to go. Boys varsity baseball lost to Northridge 13-0. Austin Bontrager had two hits. Eric Newell threw an inning of scoreless relief. Girls varsity softball lost a 3-0 lead going into the 5th inning to lose 11-3 to Northridge. Elkah DeVoe had two hits for the night going 2-3. AnaMaria Ramirez, Brynn Shoup- Hill and Maddie Cross each had a hit and one RBI. The RedHawks overall record is 5-4 and 1-1 in the NLC. The varsity girls tennis team narrowly lost to Northridge Thursday night by a score of 2-3 with the deciding match decided in a 3rd set. The RedHawks swept both doubles spots. Kathryn Detwiler and Brooke Grewe won 6-3, 6-4 while Sophia Kirkton and Katia Gutierrez came back from losing the first set 6-1 to win in three. The JV remained undefeated behind wins from Raina Shreiner Barger, Madi Rittenhouse, Sophia Kellenberger, Ally Olson, Sydney Penner, Maiah Huffman and Courtney Sloop. Boys JV baseball defeated Northridge Thursday night by a score of 8-7. After a four run first inning, the RedHawks surrendered a six run bottom of the first. After that inning the Hawks were able to climb back and eventually take the lead in the top of the 7th. Offensively, the RedHawks were led by Skylar Reyes hitting a game tying homerun in the top of the 6th. Mason Schrock, Josh Haimes and Tommy Cartagena each collected hits for the RedHawks. Joseph Good pitched 6-2/3 innings for the RedHawks allowing only one run on five hits. He struck out eleven Raiders while only walking one. This is Good’s longest outing of the young season and his first win. Girls JV & varsity tennis will host West Noble at 4:45 p.m. Boys JV (GLL) & varsity (Phend Field) baseball will host Elkhart Memorial at 5:30 p.m. Girls JV & varsity softball will play at Elkhart Memorial at 5:30 p.m.
Unified track and field will compete at Wawasee at 5:30 p.m. Boys varsity golf will compete in the Lakeland Invitational at 9:00 a.m. Girls JV softball will host Prairie Heights in a DH starting at 9:00 a.m. @ Shanklin. Girls JV tennis will play in the Plymouth Invitational at 9:00 a.m. Girls varsity tennis will host Fremont at 10:30 a.m. Girls varsity softball will host Mishawaka at 10:00 a.m. @ Shanklin. Stay In Bounds Ambassadors who visit Waterford, Chandler, Parkside, Prairie View and St. Johns on Thursdays, please meet Mr. Kissinger at the welcome center right after the end of 2nd period TODAY to depart for your April visits. Mrs. Bruder’s 5th period German 1 class will be taking A lunch TOMORROW. Thanks to those who have signed up for the blood drive, coming up TOMORROW! Everyone who signed up should check their email for important information. There are still a few spots open. See Mrs. Clark in room 2280 if you’re still interested. Our boys’ soccer program is hosting a pork, rice and bean fundraiser dinner TOMORROW. It will take place here in the high school cafeteria from 5:00-8:00 p.m. The cost is $8 for a pre-sale ticket and $10 at the door. You can dine in the cafeteria, but carry-out is available as well. Please see one of our soccer players for a ticket or contact Myron Bontreger, Matt Bjorkland, Rusty Maust Emery or Lucas Kauffman. Thank you in advance for your support! Before we finish up our “Year of Giving”, we have one last project to complete. We decided way back when that promoting a Bike to Work/School Week would be a good idea. We need to meet to discuss and plan this event. Please plan to attend TODAY in Mrs. Morrical’s room (1311) during the 2nd session of SRT if you are interested in helping out. The boys JV baseball team tied Warsaw 7-7. The RedHawks fired up the offense in the first inning, when Tommy Cartagena hit a solo homer and they also notched four runs in the fifth inning. Kaleb Nine, Sebastian Fisher, Josh Hamies and Joseph Good all drove in runs in the frame. Cartagena and Fisher each racked up multiple hits for the RedHawks. Fisher and Cartagena each collected two hits to lead the team. The defense didn’t commit a single error in the field. Boys varsity baseball opened conference play with a 7-3 win over Warsaw on a cold, damp evening. Tyler Colpitts threw a complete game, striking out 12 and only walking one. Offensively, Joey Peebles had two hits and three RBI’s and Robbie Riegsecker had two hits. Girls varsity softball scored five runs in the 6th inning to beat Warsaw 11-9 on a cold wet night. Brynn Shoup-Hill had two hits while adding three RBI’s. Grace Vance also had two hits, and a double while adding three RBI’s for the night. Grace Vance gets the win in the pitching circle. The Hawks are 5-3 overall and 1-0 in conference play. Girls JV softball overcame an early 0-6 run deficit to beat Warsaw 16-6. Maddie Swallow, Natalie Rivera and Korinn Hodges each had a hit and two RBI’s. Ally Lynn added two hits and four RBI’s, while Heather Goertzen and Sophia Koshmider each had three hits for the night. Isabel DeGraff got the win in the circle. The girls track & field team won its conference dual meet against Plymouth and Wawasee. They are now 6-2 overall and 2-2 in the conference after last night’s win. Boys JV & varsity track and field will compete in Plymouth at 5:30 p.m. Girls JV & varsity tennis will host Northridge at 4:30 p.m. 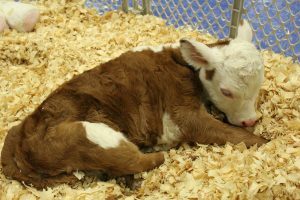 This week, the Engineering Technology classes at GHS began working with a sweet little soon-to-be-named Hereford calf who was born on Friday, April 13th. The calf is a Dwarf, bred purposely to be miniature. But she was also born with birth defects, namely, she only has one digit per foot, and her back legs are different lengths and deformed. Her front legs are strong, but due to her back leg deformities, she is unable to walk on her own. Her owners, Don and Nancy Shaum did not want to put her down, so they enlisted the help of Jen Yoder, and her Tech. Ed. classes at Goshen High School. Mrs. Yoder has been bottle feeding the young calf and taking her back and forth to school with her each day, while her students work to plan and develop a prosthetic or trainer device to help the calf stand and walk. They are also currently working on a sling solution to assist with feeding. 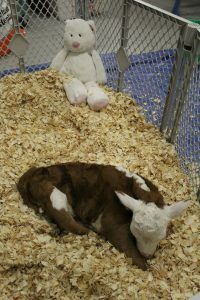 There will be several opportunities for collaborative work with the calf, including: Working with GHS science teacher Cathy DeMeyer’s classes to study the calf with regard to its biology and genetics; and Mrs. Yoder has also invited Fairfield High School’s Vet. Tech. class to be involved in studying the calf and offering input for her care. As you can imagine, GHS students and staff are very excited about this project! If you would like to follow along with the students as they work to make this calf’s life a little easier, you may follow @GHSEngineerTech on Twitter. If you are interested, you may also check in on the calf while she is at GHS. There will be a webcam on her from 8:30 a.m.-3:30 p.m. during the school day. Mrs. Bruder’s 5th period German 1 class will be taking A lunch TODAY and Friday. Reminder to all wrestlers: Open Mats have been moved to TONIGHT at 6:00 p.m. Thanks to those who have signed up for the blood drive, coming up on Friday! Everyone who signed up should check their email for important information. There are still a few spots open. See Mrs. Clark in room 2280 if you’re still interested. Our boys’ soccer program is hosting a pork, rice and bean fundraiser dinner on Friday, April 20th. 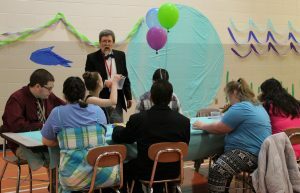 It will take place here in the high school cafeteria from 5:00-8:00 p.m. The cost is $8 for a pre-sale ticket and $10 at the door. You can dine in the cafeteria, but carry-out is available as well. Please see one of our soccer players for a ticket or contact Myron Bontreger, Matt Bjorkland, Rusty Maust Emery or Lucas Kauffman. Thank you in advance for your support! Before we finish up our “Year of Giving”, we have one last project to complete. We decided way back when that promoting a Bike to Work/School Week would be a good idea. We need to meet to discuss and plan this event. Please plan to attend Thursday in Mrs. Morrical’s room (1311) during the 2nd session of SRT if you are interested in helping out. Boys JV and varsity baseball will host Warsaw at 5:00 p.m. Girls JV and varsity softball will play at Warsaw at 5:30 p.m. Girls JV and varsity track and field will host Plymouth and Wawasee at 5:30 p.m. Reminder to all wrestlers: Open Mats have been moved to Wednesday at 6:00 p.m. Thanks to those who have signed up for the blood drive, coming up on Friday, April 20th. Everyone who signed up should check their email for important information. There are still a few spots open. See Mrs. Clark in room 2280 if you’re still interested. Mrs. Bruder’s 5th period German 1 class will be taking A lunch this Wednesday and Friday. There will be a meeting for all students interested in IB and AP art TODAY during the 2nd session of SRT in room 1450. All students interested in this please attend – especially 10th and 11th graders who are seeking a great course for serious art students who want a higher level of art work and expectations with college credit. Before we finish up our “Year of Giving”, we have one last project to complete. We decided way back when that promoting a Bike to Work/School Week would be a good idea. We need to meet to discuss and plan this event. Please plan to attend Thursday, April 19th in Mrs. Morrical’s room (1311) during the 2nd session of SRT if you are interested in helping out. POSTPONED UNTIL THURSDAY: Girls JV and varsity tennis will host Northridge at 4:30 p.m.
POSTPONED UNTIL APRIL 25TH: Boys varsity golf will play at Triton at 5:00 p.m.
POSTPONED UNTIL WEDNESDAY: Girls JV and varsity track and field will host Plymouth and Wawasee at 5:30 p.m.
**Due to game cancellations, softball and baseball players are welcome to come get their physicals without an appointment. 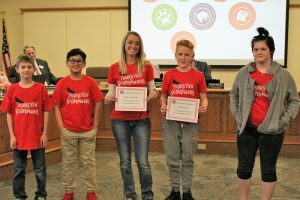 Walk-Ins start at 6:30 p.m.** Goshen High School, Goshen Middle School and Goshen Health Systems will combine efforts again this spring to offer $20 athletic physical exams to all incoming 6th-12th grade students. These physical exams will be performed by Goshen Health Systems health providers and will take place at Goshen Orthopedics and Rehabilitation Center off of CR 27 (Dierdorff Road) in Goshen. The event will take place TONIGHT from 5:30-7:30 p.m. Appointments for the exams and payments must be made in advance. You may sign up in the athletic offices at the GHS and the GMS. Payments of $20 and physical forms should be brought along when making your appointment. If we don’t fill all the spots, walk-ins will be allowed at the end of the evening. For Goshen High School students, parents should contact Mrs. Jan Schrock at jschrock@goshenschools.org or call 533-0652 to make an appointment. 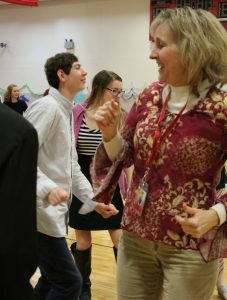 For Goshen Middle School students, parents should contact Mrs. Sue Egli at segli@goshenschools.org or call 534-6436. It is very important that parents complete the health historical page in detail before the students can begin the physical exam process. Forms can be picked up at the GMS or GHS athletic offices or found online at goshenredhawks.org under the More tab. 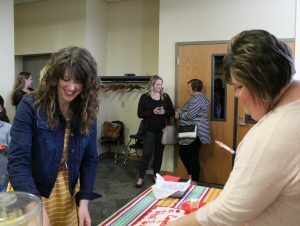 The money collected from this event is used to pay for GHS training room supplies and a scholarship for a training student. However, no student will be turned away for price. Please let Mrs. Schrock or Mrs. Egli know of your need when you make your appointment. Visit Culver’s in Goshen TONIGHT for Give Back Night from 5:00-8:00 p.m., and a percentage of the sales will be donated to GHS Key Club! Congratulations to members of the GHS Concert Band for earning a gold rating with distinction this past weekend at the annual ISSMA Concert Band contest! There will be a meeting for all students interested in IB and AP art TOMORROW during the 2nd session of SRT in room 1450. All students interested in this please attend – especially 10th and 11th graders who are seeking a great course for serious art students who want a higher level of art work and expectations with college credit. The girls varsity tennis team dropped to 0-2 after a loss to John Adams Friday, but the JV squad improved to 2-0. Raina Shreiner Barger, Sydney Penner, Courtney Sloop, Madison Rittenhouse and Maiah Huffman all dropped one game or fewer during their wins. Tonight’s softball and baseball games are all postponed until Thursday. This sweet little yet-to-be-named Hereford calf is only three days old. She was born with Dwarfism and birth defects, including having only one digit per foot. 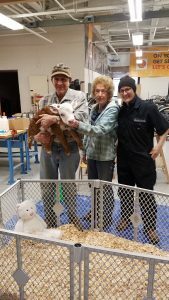 Her owners, Don and Nancy Shaum did not have the heart to put her down, so they enlisted the help of the engineering technology classes at Goshen High School. The technology teacher, Jen Yoder, is no stranger to animals and she does not shy away from a challenge. Mrs. Yoder plans to bottle feed the young calf and take her back and forth to school with her each day, while her students work to develop a prosthetic or trainer device to help the calf stand and walk. Mrs. Yoder said that there will be several opportunities for collaborative work with the calf, including: Working with GHS science teacher Cathy DeMeyer’s classes to study the calf with regard to its biology and genetics; and Mrs. Yoder will also invite Fairfield High School’s Vet. Tech. class to be involved in studying the calf and offering input for her care. As you can imagine, everyone is very excited about this project! We will periodically post updates on the developments of this project. If you would like to follow along, you may follow @GHSEngineerTech on Twitter. Key Club is collecting personal care items THIS WEEK for the Parent Comfort Cart at Riley Hospital for Children in Indianapolis. Travel-sized soap, shampoo, conditioner, deodorant, lotion, shaving cream, toothpaste, mouthwash and contact lens solution can be donated in the Guidance Office. Key Club appreciates your support of Riley Hospital! 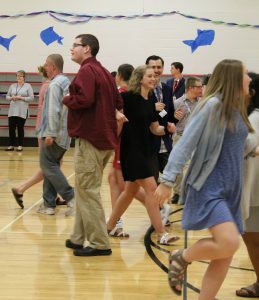 Don’t miss the Talent Show TONIGHT from 7:00-9:00 p.m.
Goshen High School, Goshen Middle School and Goshen Health Systems will combine efforts again this spring to offer $20 athletic physical exams to all incoming 6th-12th grade students. These physical exams will be performed by Goshen Health Systems health providers and will take place at Goshen Orthopedics and Rehabilitation Center off of CR 27 (Dierdorff Road) in Goshen. 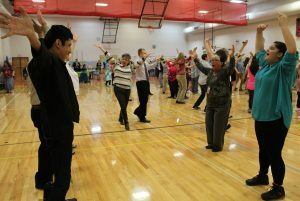 The event will take place from 5:30-7:30 p.m. on Monday, April 16th. Appointments for the exams and payments must be made in advance. You may sign up in the athletic offices at the GHS and the GMS. Payments of $20 and physical forms should be brought along when making your appointment. If we don’t fill all the spots, walk-ins will be allowed at the end of the evening. For Goshen High School students, parents should contact Mrs. Jan Schrock at jschrock@goshenschools.org or call 533-0652 to make an appointment. 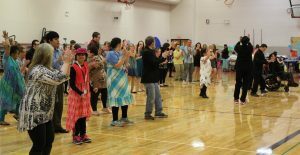 For Goshen Middle School students, parents should contact Mrs. Sue Egli at segli@goshenschools.org or call 534-6436. It is very important that parents complete the health historical page in detail before the students can begin the physical exam process. Forms can be picked up at the GMS or GHS athletic offices or found online at goshenredhawks.org under the More tab. 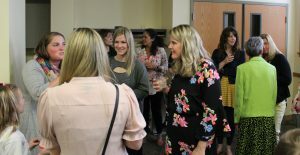 The money collected from this event is used to pay for GHS training room supplies and a scholarship for a training student. However, no student will be turned away for price. Please let Mrs. Schrock or Mrs. Egli know of your need when you make your appointment. Visit Culver’s in Goshen for Give Back Night on Monday, April 16th from 5:00-8:00 p.m., and a percentage of the sales will be donated to GHS Key Club! The spring blood drive will be held in the GHS main gym on Friday, April 20th. Sign-ups are taking place in social studies classes THIS week. See Mrs. Clark in room 2280 with questions. 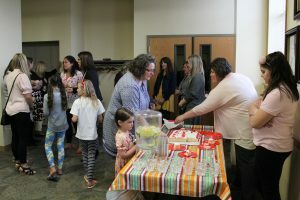 LoveWay is looking for volunteers! LoveWay provides therapeutic equestrian programs for people with special needs. Our volunteers help as Horse Leaders and Side Walkers in our classes and summer camps, and with morning and afternoon feeding, weeding and brush trimming, office projects, photography and technology—mornings, afternoons and some evenings. LoveWay’s 29-acre center is located between Bristol and Middlebury, with an indoor arena, outdoor arena, outdoor riding trails and about 20 horses. 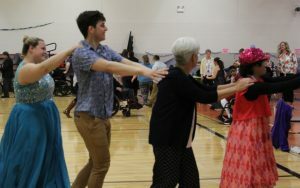 For more information about volunteering now or this summer, or doing community service hours for National Honor Society or class requirements, contact volunteer@lovewayinc.org, call 574-825-5666 or visit www.lovewayinc.org. IHSAA Student-Athlete Tip of the Week: There were many interesting stories coming out of Augusta National last week during the playing of golf’s most prestigious tournament, the 2018 Masters. Patrick Reed was the winner, with Rickie Fowler and Jordan Spieth finishing 2nd and 3rd. However, it’s what Spieth said after his round that really surprised me. He said he played the entire day without ever looking at the scoreboard. He played for over five hours without knowing how anyone else was scoring, but himself. This process is somewhat common in individual sports. Players this past week said over and over that they only focused on their own game and what they could control. No need worrying about the opponent. In team sports the participants are constantly looking at the time and score. Strategy and game plans depend on those circumstances. However, professional golfers and others that play individual sports will tell you there’s no need to worry about the opponent and what they are doing. They will tell you to concentrate on the things that you can control, and don’t worry about the others! There will be a meeting for all students interested in IB and AP art Tuesday during the 2nd session of SRT in room 1450. All students interested in this please attend – especially 10th and 11th graders who are seeking a great course for serious art students who want a higher level of art work and expectations with college credit. Boys JV baseball (2-1) dropped an extra inning game to Mishawaka, losing by a score of 13-9. The RedHawks entered the last inning leading by a score of 9-4 and Mishawaka scored nine unanswered runs to win the game in extra innings. Despite the loss, the RedHawks did collect eight hits, led by Skylar Reyes and Jocsan Sanchez. They each tallied two hits. Bryce Smith started the game for the RedHawks and surrendered only one run on one hit over three innings. He added four strikeouts to his total as well. Boys varsity golf moved to 4-2 on the year with a win over Elkhart Central at Maplecrest Country Club. The RedHawks were led by Peyton Cripe with a 43, Allan Garratt 46 and Ethan Vallejo 47. The girls varsity softball team lost 11-10 to Triton. The RedHawks battled in the top of the 7th inning trailing 8-9 to take the lead 10-9 going into the bottom of the 7th. Triton then manufactured two runs in the bottom of the 7th for the win. Ashton Darnell and Brynn Shoup-Hill each added two hits for the contest. Maddie Cross, AnaMaria Ramirez and Makayla Snyder had two RBI’s. Boys JV golf beat Elkhart Central at Maplecrest Country Club by a score of 205-235. The JV was led by Ben Schneider with 48, Joseph Narayan 50 and Kaden Sheets 52. Boys varsity golf defeated Elkhart Central 188-192. The girls varsity tennis team narrowly dropped their season opener by a score of 2-3 to Wawasee. Freshman Lucy Kramer, sophomore Sophie Kirkton and junior Katia Gutierrez scored the points for Goshen. The JV won by a score of 5-2 behind wins from Raina Shreiner Barger, Madi Rittenhouse, Courtney Sloop, Sophia Kellenberger, Ally Olson, Sydney Penner and Maiah Huffman. Girls JV and varsity tennis will host John Adams at GMS at 4:45 p.m. Girls varsity track and field will compete in the Carmen Cripe Relays at Northridge at 9:15 a.m. Boys varsity golf will host the Goshen Invitational at Maplecrest at 10:00 a.m. Girls softball will play at Fairfield. Varsity plays at 10:00 a.m., followed by JV at 12:00 p.m. Girls varsity tennis will host the Goshen Round Robin at GMS at 10:00 a.m. Boys JV and varsity baseball will travel to Clarke Park to play LaPorte in a DH starting at 11:00 a.m. 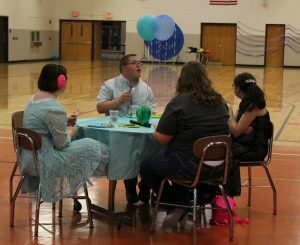 The annual Life Skills Prom was held at Goshen High School today. 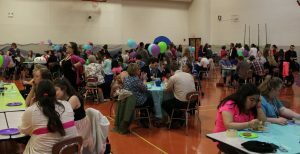 This year’s theme was Under the Sea. 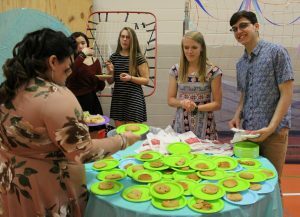 GHS student council members, led by their sponsor Jaimie Pierce, assisted with decorating, serving lunch, and making sure everyone had a good time. 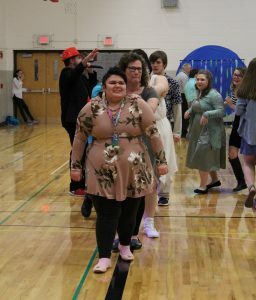 Students from GHS, Northridge, Fairfield, Concord, and the Young Adult Program came to the prom dressed up and ready to dance! 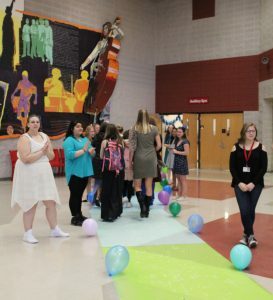 Below, neighboring schools were welcomed to the prom by student council members. The DJ from Epic Events kept things moving with some great music. 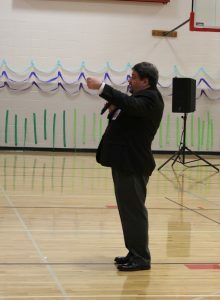 As the host, GHS teacher Shane Mullett welcomed everyone, and provided instructions for lunch. 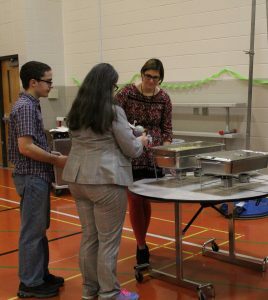 And then the student council members served lunch to the guests. 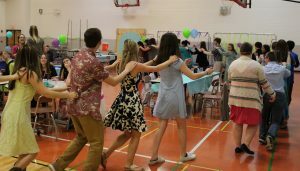 One student had a birthday, so they celebrated by inviting her to lead the conga line. 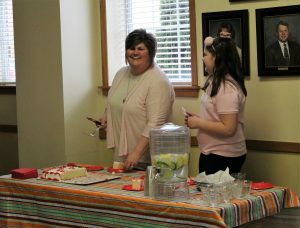 The day looked like a big success, with smiles all around! Girls Soccer open field starts TODAY after school from 4:15-5:45 p.m. Meet outside at the practice soccer field with your cleats and shin guards. Seniors & Juniors Who Are Graduating Early: If you still need to order a cap and gown you can visit their web site at www.highschool.herffjones.com to place an order. Cap & Gown Delivery Day will be TODAY during SRT at the concession stand by the main gym. Please plan to pick up items at this time. Don’t miss the Talent Show TOMORROW from 7:00-9:00 p.m. There will be two LIFEGUARDING classes offered at the Aquatic Center. The 1st class starts TODAY and meets on Tuesday and Thursday evenings from 6-9:00 p.m. through May 10th. The 2nd class will meet the 2nd full week of June (June 11th-14th), and will meet Monday-Thursday during the day. To register for the classes, go to the Aquatic Center website at Aquatics.goshenschools.org and click on LifeGuard Registration. Stay In Bounds Ambassadors meet TODAY during the 2nd session of SRT in the main gym to plan for our last formal visits, which will be the following week assuming there are no conflicts at the schools. Please notify Mr. Kissinger in advance if you have any conflicts. There will be a meeting for all students interested in IB and AP art next Tuesday during the 2nd session of SRT in room 1450. All students interested in this please attend – especially 10th and 11th graders who are seeking a great course for serious art students who want a higher level of art work and expectations with college credit. Before we finish up our “Year of Giving”, we have one last project to complete. We decided way back when that promoting a Bike to Work/School Week would be a good idea. We need to meet to discuss and plan this event. Please plan to attend next Thursday, April 19th in Mrs. Morrical’s room (1311) during the 2nd session of SRT if you are interested in helping out. The girls track and field team lost its conference opener to Warsaw and Northridge falling to 4-2 overall and 0-2 conference record. Boys varsity baseball lost a hard fought game to Fort Wayne Homestead 7-4. Joey Peebles was the tough luck loser throwing 5-2/3 innings with seven strikeouts. Reece Fisher and Will Koshmider both had doubles offensively. Girls JV softball lost to Elkhart Central 17-14. Cat Hoover, Jordan DeGraff, Sophia Kosmider and Melissa Garcia each had two hits. Korrin Hodges added a RBI single. Girls varsity softball lost to Elkhart Central 5-7. AnaMaria Ramirez had two hits for the night. Ashton Darnell and AnaMaria Ramirez each added a double for the RedHawks. Grace Vance had two RBI’s. Maddie Cross and Makayla Snyder each had a stolen base. Their overall record for the RedHawks is 4-2. Girls JV and varsity tennis will play at Wawasee at 4:30 p.m. Boys JV and varsity golf will host Elkhart Central at Maplecrest at 5:00 p.m. Boys JV and varsity track and field will compete against Northridge and Northwood at Northridge Middle School at 5:00 p.m. Girls varsity softball will play at Triton at 5:30 p.m. Girls JV softball will host Triton at 5:30 p.m. @ Shanklin. Boys JV baseball will host Mishawaka at 5:15 p.m. @ Phend Field. Seniors & Juniors Who Are Graduating Early: If you still need to order a cap and gown you can visit their web site at www.highschool.herffjones.com to place an order. Cap & Gown Delivery Day will be TOMORROW during SRT at the concession stand by the main gym. Please plan to pick up items at this time. There will be two LIFEGUARDING classes offered at the Aquatic Center. The 1st class starts TOMORROW and meets on Tuesday and Thursday evenings from 6-9:00 p.m. through May 10th. The 2nd class will meet the 2nd full week of June (June 11th-14th), and will meet Monday-Thursday during the day. To register for the classes, go to the Aquatic Center website at Aquatics.goshenschools.org and click on LifeGuard Registration. 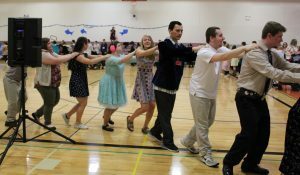 Don’t miss the Talent Show on Friday, April 13th from 7:00-9:00 p.m.
Stay In Bounds Ambassadors meet TOMORROW during the 2nd session of SRT in the main gym to plan for our last formal visits, which will be the following week assuming there are no conflicts at the schools. Please notify Mr. Kissinger in advance if you have any conflicts. The boys JV baseball team overcame a slow start offensively to defeat Jimtown 5-3. The RedHawks got a great start from Kaleb Nine who pitched four innings allowing only one run on two hits and struck out eight Jimmies. Skylar Reyes got the win for the RedHawks pitching two innings, allowing one run on no hits and one strike out. Joseph Good got the save for the RedHawks pitching one inning to close the game. The Jimmies got an early 2-0 lead but the RedHawks were able to battle back in the last inning. Offensively the RedHawks struggled early but had a spark from Skylar Reyes and Tommy Cartagena late in the game to give the RedHawks the victory. Boys varsity baseball defeated Jimtown 10-0. Austin Cain pitched the complete game with a five inning run rule. Cain gave up three hits and struck out six. Will Koshmider had two hits including a double. Robbie Riegsecker had two hits with a double. Girls varsity softball defeated Bethany Christian 21-1 in five innings. Brynn Shoup-Hill earned the win in the pitching circle throwing two complete innings. Grace Vance came in to pitch the 3rd-5th inning. Senior Maddie Cross and Sophomore Alexis Navarro each had four hits apiece. Grace Vance, Ashton Darnell and Brynn Shoup-Hill all added three hits apiece for the night. Boys varsity golf traveled to Maxwelton Golf Course in Syracuse to take on Lakeland, West Noble, and Elkhart Memorial. Scores were: Goshen 177, Memorial 192, West Noble 198 and Lakeland 206. Their record is 3-2. Goshen was led by match medalist Peyton Cripe who fired a 38. Allan Garratt shot 44, Jake Jennette shot 46, Ethan Vallejo fired a 49 and Cameron Schneider shot 51. Girls varsity softball will host Elkhart Central @ Shanklin at 5:00 p.m. Girls JV softball will host Elkhart Central @ Goshen LL at 5:00 p.m. Boys varsity baseball will host Homestead @ Phend Field at 5:15 p.m.